Editor's Pick of the Week: All New Feature! Usually Mondays mean "Shoe of the Week," but I've decided to expand the feature to "Pick of the Week" so I can showcase a variety of amazing fashion finds (including shoes, of course). 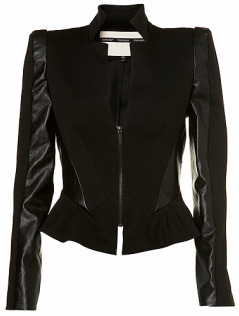 We're kicking off the new feature with this paneled peplum jacket from Top Shop. It's a little pricey at a $135, but if you're looking to add serious edge to your fall/winter wardrobe, it's a worthy buy. Plus, as Jael pointed out when she recommended it to me, this is a great way to channel Gareth Pugh if you don't happen to have a couple thousand dollars in your jacket budget this season. What do you think? As with all our posts, we love suggestions. If you find an item you'd like to see as the "Pick of the Week," email us a link at editor[at]fashionmefabulous[dot]com.